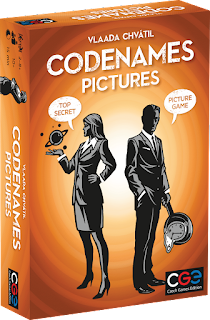 I love, love, love the original version of Codenames, the word-linking party game from the awesome Vlaada Chvátil (Galaxy Trucker, Mage Knight, Dungeon Lords) and having tried out a prototype of Codenames: Pictures at last year's UK Games Expo I decided that I liked this version even more! Now the proud owner of my own copy of the game, I thought with the anniversary of my first game approaching it would be fun to share the love and give away a copy to someone in the UK - see below. As with the original game, players divide into two teams, red and blue, with each team picking a 'spymaster' who will try to link certain pictures in a 4-by-5 grid by giving one-word clues for the rest of their team to guess. 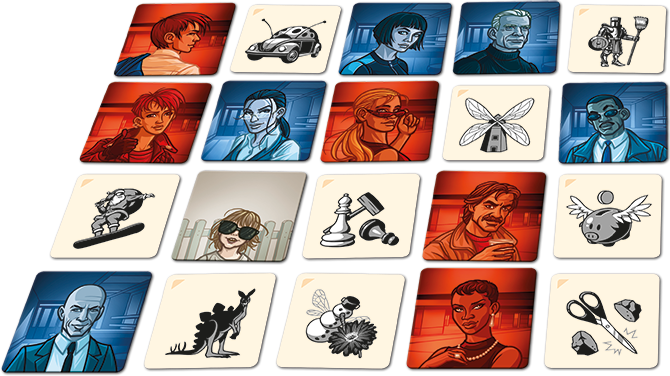 These pictures represent a network of agents and their codenames, and the first team to correctly locate all of their team's agents wins. 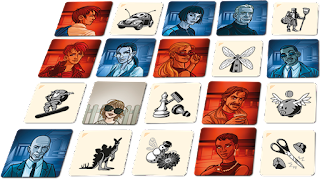 Even if you already have the original version of Codenames, I think there's still plenty of room for both versions in anyone's collection. The word and picture versions appeal to different people, depending on how their brains like to work, and the picture version also allows younger players to join in on the fun more easily by completely removing the language dependence. It's really fun to make super-tenuous links that test how much you're on the same wavelength as your friends - especially when they work out the right answers!